If you are a fan of Japanese manga and anime, you will find lots of sources on the Internet that allow you to read or view those online, or even download them to your local PC for offline reading. And while some sites may be borderline-legal, or not legal at all in some countries, what they offer may be perfectly legal in others. Before I'm getting into another argument about the legality of those sites and tools, I'd like to point out that I'm reviewing an application, and that it is the decision of the individual to use it or not. 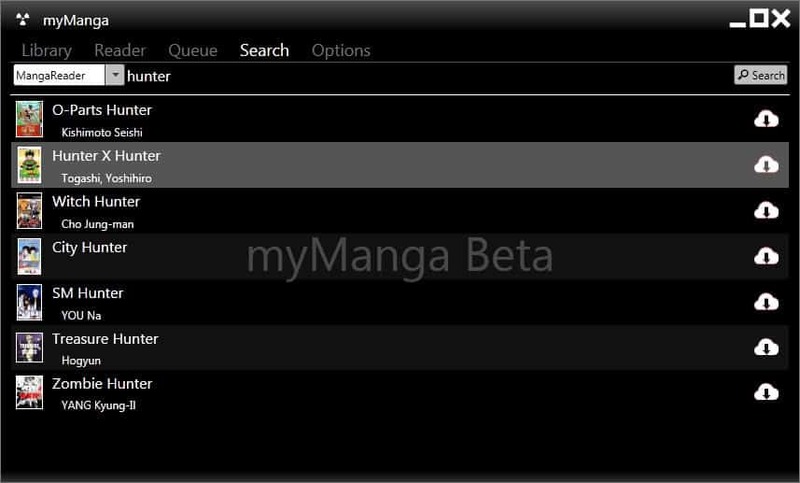 MyManga is a program for the Windows operating system that you can use to download, read and organize manga. It lets you search various manga websites on the Internet, download manga series information and chapters, and read the manga using the built-in reader. The program does not need to be installed, and will launch directly after you have downloaded and unpacked it on your computer system. 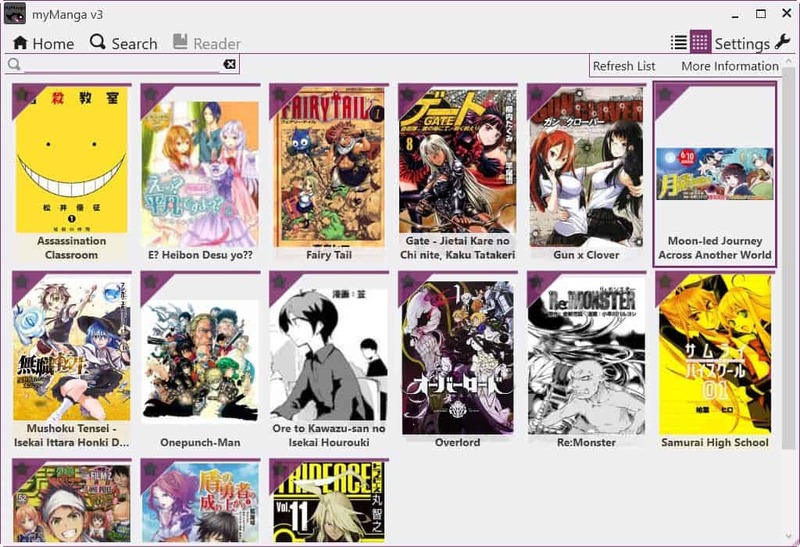 It displays a selection of manga to you on its frontpage on first start, but those are just default items added to the library but not available for offline reading right away. You can use the search function to find manga that you are interested in. MyManga scans the archives of several popular online manga repositories including MangaReader, MangaHere and MangaPanda. A click on "add to library" adds the selected manga to the local library. 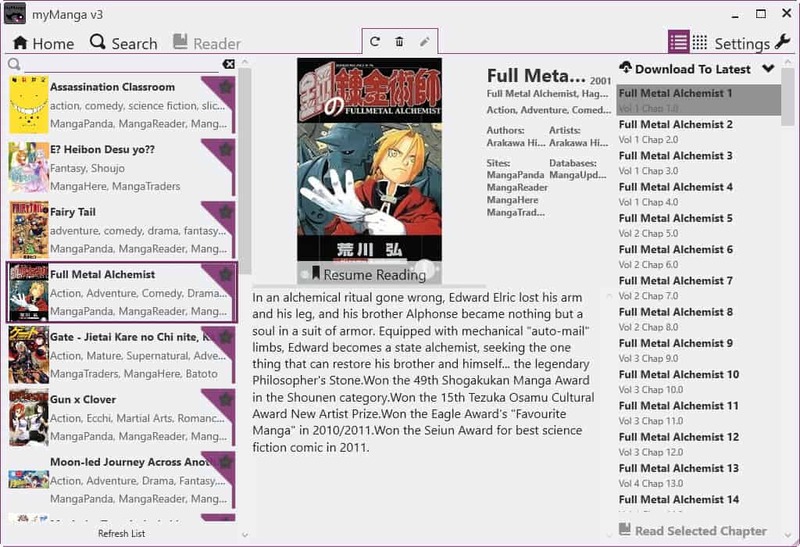 You need to switch to a different view mode or click on "more information" on the library page to display information about the selected manga as well as download options. You find all manga of your library on the left, and a description and information about the selected manga on the right. It is possible to switch between the manga here. You have two options to read manga using the MyManga application. First, you may select any chapter displayed to you and hit the "read selected chapter" button afterwards. MyManga starts to download that chapter to your local system and you can start reading it once that is done as it switches to reader mode right away. The second option that you have is to select the "download to latest" option instead which will download all chapters and volumes of the selected manga to the local system for offline reading. Downloads may take a while depending on your Internet connection, the selected manga, and the host. The reader itself is basic, it allows you to zoom in and out of a page (using shortcuts if you want or the mouse), to flip back and forth, and to select a specific page from the page selection menu at the bottom. 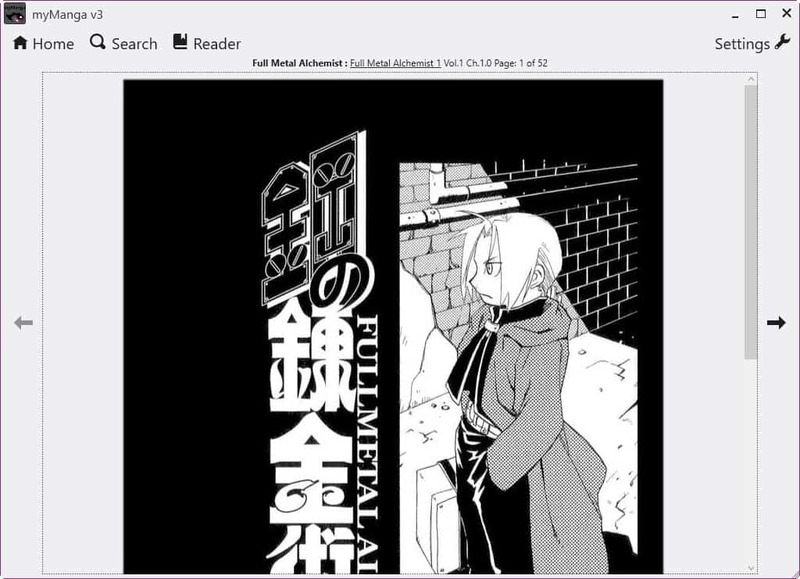 You may also click on the name of the manga at the top to display a thumbnail bar of all pages of the selected chapter to jump directly to a certain page. The reader indicates the volume, chapter and page you are on. The preference list options of interest. You may switch the default theme from light to dark, change the default zoom amount, and configure how many chapters you want to keep (or disable the feature to keep all). There you find listed the sources, including non-English repositories, which may be useful if you want those added or some of the sources removed if you prefer others. The author of the program has plans to integrate additional features into it, including bookmarks, auto update options and options to archive favorite chapters. The program requires the Microsoft .Net Framework 4.0. It is compatible with all recent 32-bit and 64-bit editions of the Windows operating system. A source code is provided on the project's GitGub page. MyManga is a useful manga downloader and reader application. The program has a few usability issues that could improve it further. It is for instance not possible to click on a library item in the default view to jump to it right away. While that is likely a bug, it is something that needs addressing quickly. Thanks for the review and blog post. Added a link to this post from myManga’s documentation. John thanks for that, keep up the good work, I’ll definitely keep an eye on the program’s development. This is unlicensed manga on this app. For the Mangaka, our very much appreciated manga writers, we as true fans should reward them for their time and effort put in good work for our pleasure as well as contribute to the funding of the manga we enjoy through purchasing. Try Viz.com and its app for Shonen jump manga. It is a start and it is $4.99 for a volume (which offers 10-11 chpaters each) and you get a free previews of the first 59pages of all the ”1st” volumes of Shonen jump series(plural). Vizanime.com has episodes of shonenjump anime for free, but it is licensed builds views for the actual distributors of the anime. I would help you find funimation and other brands of anime/manga, but truly am a shonen jump fan, so I will leave that research to you. So give the mangaka a chance, they have an idea of what we want and are working progressively faster to make us happy. The distributors are fighting for our love of the manga and manga, so Please give them your support. This is one beautiful program its actually exactly what ive been looking for. Could you add the ability to add your own manga sources? Like, say batoto? You follow the link in the second paragraph and click on download on the Codeplex website. how to run the application?mine is 64 bit…that say i must install on of the following versions of the .NET Framework: v4.0.30319. I already have many manga in image format. how do I add it to Reader Application ? but i cant seem to open the mymanga.exe. the error says that mymanga has stopped working. but it seems that i cant run the application. the error is “mymanga has stopped working”.